Ghost Train Haze is a well-known Sativa dominant hybrid strain. It is a cross between Neville’s Wreck and Ghost OG. This beautiful hybrid is a two-time High Times Cannabis Cup award winner. Named the “Most Potent Strain on Earth” by High Times magazine in 2012, the THC level can reach up to 28%. Ghost Train Haze has bright green buds which are extremely dense and coated with an abundance of white crystals. The odor of Ghost Train Haze resembles that of OG Kush. Its signature sweetness has plenty of citrus notes and elements of sharp pine. 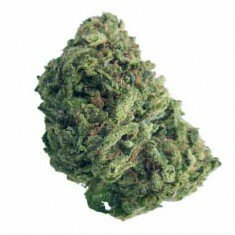 This strain delivers both the head-heavy euphoria of Sativa and body-heavy stone of an Indica. While this awesome strain can boost your energy levels and give uplifting euphoria, it is better advised to save it for night use due to the cerebral haziness that is associated with higher doses. If you plan on having an active day, it is best to keep the dose low or moderate. Patients prone to anxiety should steer clear of this heavy-hitter. Ghost Train Haze has a wide array of medical applications. It is a versatile strain that helps in the treatment of Cancer, Chronic Pain, Nausea, Migraines, Fatigue, Inflammation and Loss of Appetite. It also gives relief to patients suffering from mental disorders including Depression and Post-traumatic Stress Disorder. In light doses, it is useful for those with ADD and ADHD. Good strain, boosted my energy levels !!!! Best Stuff !! my favorite.